The AVR ATmega MCU used by the Arduino Uno and its clones and peers (Leonardo, Pro, Fio, LilyPad, etc) and the Arduino Mega have the capability to use their USART (Universal Serial Asynchronous Receiver Transmitter), also known as the Serial Port, as an additional SPI bus interface in SPI Master mode. This fact is noted in the datasheets of the ATmega328p, ATmega32u4, and the ATmega2560 devices at the core of the Arduino platforms, but until recently it hasn’t meant much to me. Over the past 18 months I’ve been working on an advanced derivative of the Arduino platform, using an ATmega1284p MCU at its core. I consider the ATmega1284p device the “Goldilocks” of the ATmega family, and as such the devices I’ve built have carried that name. Recently I have been working on a platform which has some advanced analogue output capabilities incorporating the MCP4822 dual channel DAC, together with a quality headphone amplifier, and linear OpAmp for producing buffered AC and DC analogue signals. This is all great, but when it comes down to outputting continuous analogue samples to produce audio it is imperative that the sample train is not interrupted or the music simply stops! The issue is that the standard configuration of the Arduino platform (over)loads the SPI interface with all of the SPI duties. In the case of the Goldilocks and other Arduino style devices I have ended up having the MicroSD card, some SPI EEPROM and SRAM, and the MCP4822 DAC all sharing same SPI bus. This means that the input stream of samples from the MicroSD card are interfering and time-sharing with the output sample stream to the DAC. The MicroSD card has a lot of latency, often taking hundreds of milliseconds to respond to a command, whereas the DAC needs a constant stream of samples with no jitter and no more than 22us between each sample. That is a conflict that is difficult to resolve. Even using large buffers is not a solution, as when streaming audio it is easy to consume MBytes of information; which is orders of magnitude more than can be buffered anywhere on the ATmega platform. Other solutions using a DAC to generate music have used a “soft SPI” and bit-banging techniques to work around the issue. But this creates a performance limitation as the maximum sample output rate is strongly limited by the rate at which the soft SPI port can be bit-banged. There has to be a better way. The better way to attach SPI Slave devices to the ATmega platform is referenced in this overlooked datasheet heading: “USART in SPI mode”. Using the USART in “Master SPI Mode” (MSPIM) is may be limiting if you need to use the sole serial port to interact with the Arduino (ATmega328p), but once the program is loaded (in the case of using a bootloader) there is often no further need to use the serial port. But for debugging if there is only one USART then obviously it becomes uncomfortable to build a system based on the sole USART in SPI mode. However in the case of the Goldilocks ATmega1284p MCU with two USARTs, the Arduino Leonardo with both USB serial and USART, and the Arduino Mega ATmega2560 MCU with four USARTs, there should be nothing to stop us converting their use to MSPIM buses according to need. Excuse me for being effusive about this MSPIM capability in the AVR ATmega. It is not exactly a secret as it is well documented and ages old, but it is a great feature that I’ve simply not previously explored. But now I have explored it, I think it is worthwhile to write about my experience. Also, I think that many others have also overlooked this USART MSPIM capability, because of the dearth of objective review to be found on the ‘net. Any ATmega datasheet goes into the detailed features and operation of the USART in SPI mode. I’ll go into some of the features in detail and what it means for use in real life. Full Duplex, Three-wire Synchronous Data Transfer – The MSPIM does not rely on having a Slave Select line on a particular pin, and further it doesn’t rely on having both MOSI and MISO lines active at the same time. This means that it is possible to attach a SPI Slave device that doesn’t use the _SS to begin or end transactions with just two pins, being the XCK pin and the Tx pin. If a _SS is required (as in the MCP4822) then only three wires are required. The fact that the MISO (Rx) pin is optional saves precious pins too. Master Operation – The MSPIM only works in SPI Master mode, which means that it is only really useful for connecting accessories. But in the Arduino world, that is what we are doing 99% of the time. 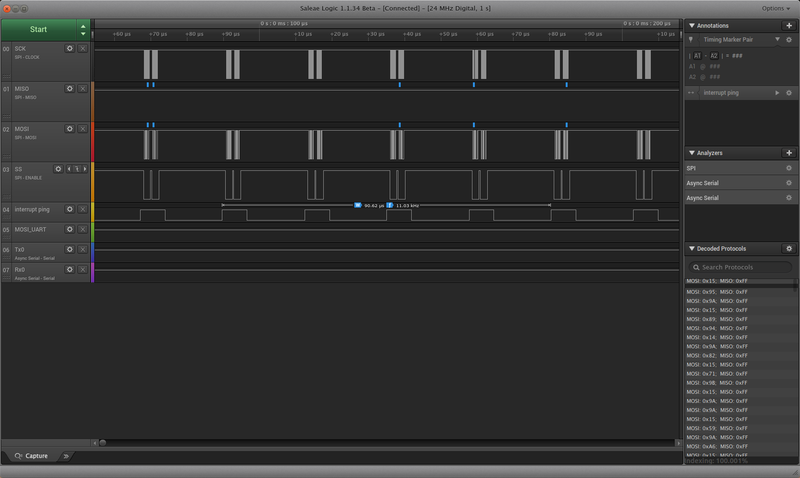 Supports all four SPI Modes of Operation (Mode 0, 1, 2, and 3) – yes, it does. LSB First or MSB First Data Transfer (Configurable Data Order) – yes, it does. Queued Operation (Double Buffered) – The MSPIM inherits the USART Tx double buffering capability. This is a function not available on the standard SPI interface and is a great thing. For example, to output a 16bit command two writes to the I/O register can follow each other immediately, and the resulting XCK has no delay between each Byte output. To output a stream of bytes the buffer empty flag can be used as a signal to load the next available byte, ensuring that if the next byte can be loaded with 16 instructions then we can generate a constant stream of bytes. In contrast with the standard SPI interface transmission is not buffered and therefore in Master Mode we’re invariably wait-looping before sending the next byte. This wastes cycles in between each byte in recognising completion, and then loading the next byte for transmission. High Resolution Baud Rate Generator – yes, it is. The MSPIM baud rate can be set to any rate up to half the FCPU clock rate. Whilst there may be little need to run the MSPIM interface at less than the maximum for pure SPI transactions, it is possible to to use this feature, together with double buffered transmission, to generate continuous arbitrary binary bit-streams at almost any rate. High Speed Operation (fXCKmax = FCPU/2) – The MSPIM runs at exactly the same maximum clock speed as the standard SPI interface, but through the double buffering capability mentioned above the actual byte transmission rate can be significantly greater. Flexible Interrupt Generation – The MSPIM has all the same interrupts as the USART from which it inherits its capabilities. In particular the differentiation between buffer space available flag / interrupt and transmission complete flag / interrupt capabilities make it possible to develop useful arbitrary byte streaming solutions. As the USART in normal mode and the USART in MSPIM mode are quite similar in operation there is little that needs to be written. The data sheet has a very simple initialisation code example, which in practice is sufficient for getting communications going. I would note that as there is no automatic Slave Select management, the _SS line needs to be manually configured as an output, and then set (high) appropriately until such time as the attached SPI device is to be addressed. Also note that the XCKn (USART synchronous clock output) needs to be set as an output before configuring the USART for MSPIM. And also to note that the transmission complete flag (TXCn) is not automatically cleared by reading (it is only automatically cleared if an Interrupt is processed), and needs to be manually cleared before commencing a transmission (by writing a 1 to the TXCn bit) it you are planning to use it to signal transaction completion in your code. The Transmit and Receive Data Register (UDRn) is also not automatically cleared, and needs to be flushed before use if a receive transaction is to synchronised to the transmitted bytes. SPI_PORT_DIR_SS |= SPI_BIT_SS;   // Set SS as output pin. SPI_PORT_SS |= SPI_BIT_SS;       // Pull SS high to deselect the SPI device. UCSR1B = _BV(TXEN1);             // Enable transmitter. Enable the Tx (also disable the Rx, and the rest of the interrupt enable bits set to 0 too). // Set baud rate. IMPORTANT: The Baud Rate must be set after the Transmitter is enabled. And a fragment of the code to transmit a 16 bit value looks like this. Note with this example there is no need to wait for the UDREn flag to be set between bytes, as we are only writing two bytes into the double transmit buffer. This means that the 16 clocks are generated on XCKn with no gap in delivery. UCSR1A = _BV(TXC1);              // Clear the Transmit complete flag, all other bits should be written 0. SPI_PORT_SS &= ~_BV(SPI_BIT_SS); // Pull SS low to select the SPI device. UDR1 = write.value.u8;        // Begin transmission of first byte. UDR1 = write.value.u8;        // Continue transmission with second byte. while ( ! (UCSR1A & _BV(TXC1)) ); // Check we've finished, by waiting for Transmit complete flag. SPI_PORT_SS |= _BV(SPI_BIT_SS);  // Pull SS high to deselect the SPI device. 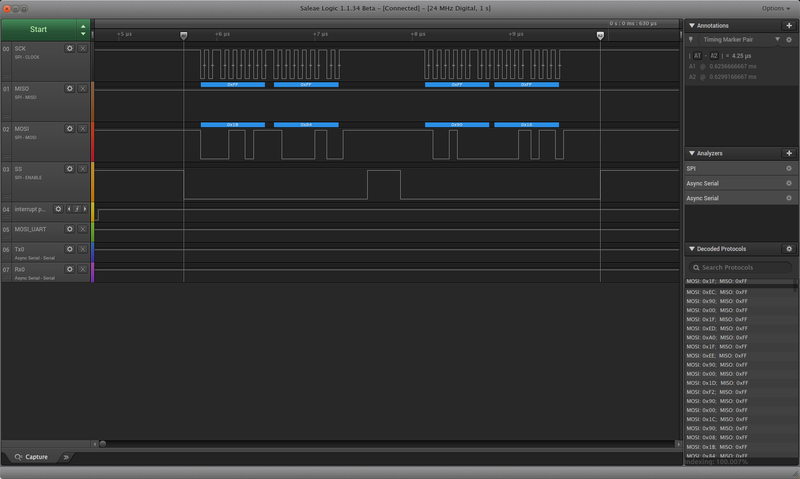 Looking at the output generated by the two different SPI interfaces on the AVR ATmega, it is easy to see the features in action. In the first image we can see that the two bytes of the 16 bit information for the DAC are separated, as loading the next byte to be transmitted requires clock cycles AFTER the transmission completed SPIF flag has been raised. DAC control using SPI bus. In the case of the MSPIM output, we can’t recognise where the two bytes are separated, and the end of the transaction is triggered by the Transaction complete flag. This example shows that the MSPIM can be actually faster than the standard SPI interface, even though the maximum clock speed in both cases is FCPU/2. DAC control using USART MSPIM bus. The final image shows the Goldilocks DAC generating a 44.1kHz output signal, with dual 12 bit outputs. Whilst this is not fully CD quality, comparisons with other DAC solutions available on the Arduino platform have been favourable. 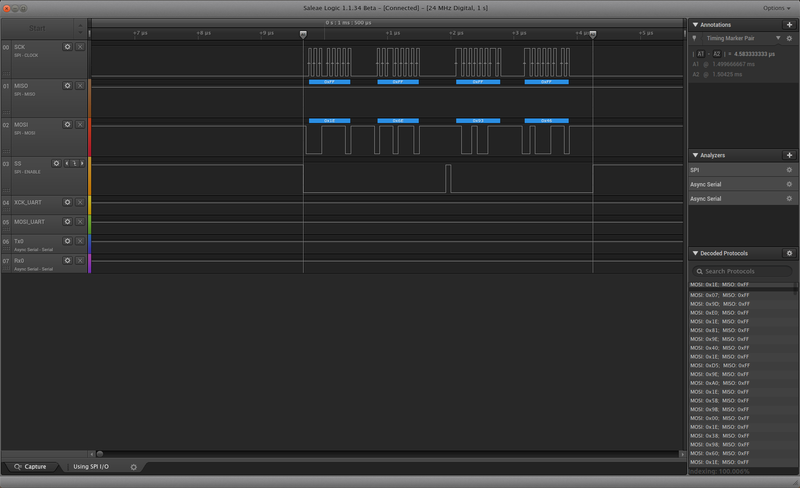 44.1kHz samples using USART MSPI output. I am now convinced to use the USART MSPIM capability for the Goldilocks Analogue, and I think that it is time to write some generalised MSPIM interface routines to go into my AVRfreeRTOS Sourceforge repository to make it easy to use this extremely powerful capability. This entry was tagged 1284p, arduino, atmega1284, atmel, avr, mspim, spi, usart. Bookmark the permalink.